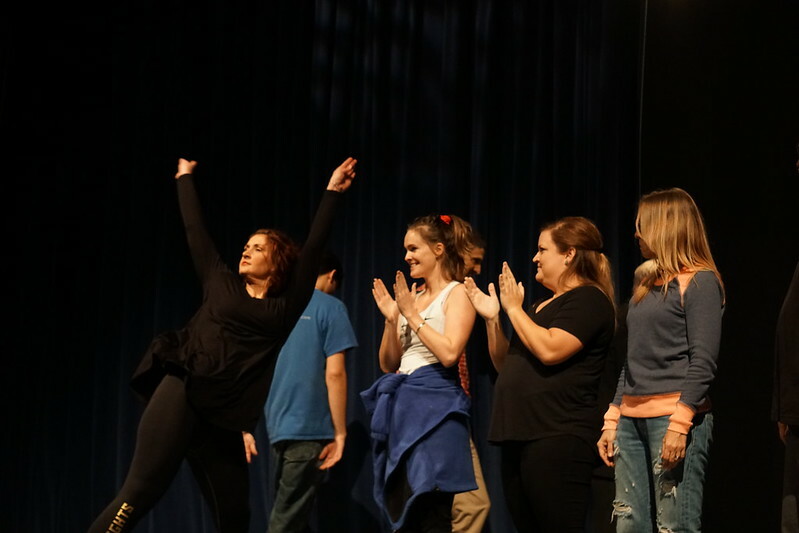 Full of musical numbers, sarcastic skits, odd outfits, and of course, talented teachers, McCallum’s fifth annual Teachers & Tiaras offered something for everyone. On Friday evening, in the midst of 42nd Street opening night and a boys varsity basketball game with major playoff implications, the pageant was held in the Fine Arts Building Theatre and featured nine brave Maculty contestants, including Paul Pew, Daniel Vega, Mickey Folger, Oakley Barber, Steven Strong, Nikki Northcutt, Katie Carrasco, Richard Cowles and Lucy Griswold. The field also included a masked mystery teacher. The evening was co-hosted by Diana Adamson and sophomore Jude Gravois. The nine contestants battled it out with the talent, evening wear and question portions of the night with the winner being determined by votes purchase by audience members. The event, which was not held last year, is a fundraiser for the film program. In the end, Northcutt took home the first place prize, followed closely behind by Strong in second place and Carrasco in third. The show included everything from a horrifying skateboarding story (Folger), to an anti-bullying song number (Strong), to an onstage zumba class (Griswold) and more. It even featured the Unknown Teacher comic (we are almost positive it was Mr. Rogers), a MAC faculty member performing a comedy sketch with a paper bag over his head to conceal his identity.